Today, Iâ€™m bringing you guys something a little different and reviewing the UTG Xenon Tactical Light, model ZL337 (all â€œleetâ€ jokes aside); the new high performance taclight by Leapers/UTG. It is one of their newest tactical lights, and is arguably one of the finest and brightest lights that they have produced. It offers extremely high performance and versatility at a very affordable price, as well as being covered by a one year warranty covering defects in materials and workmanship. 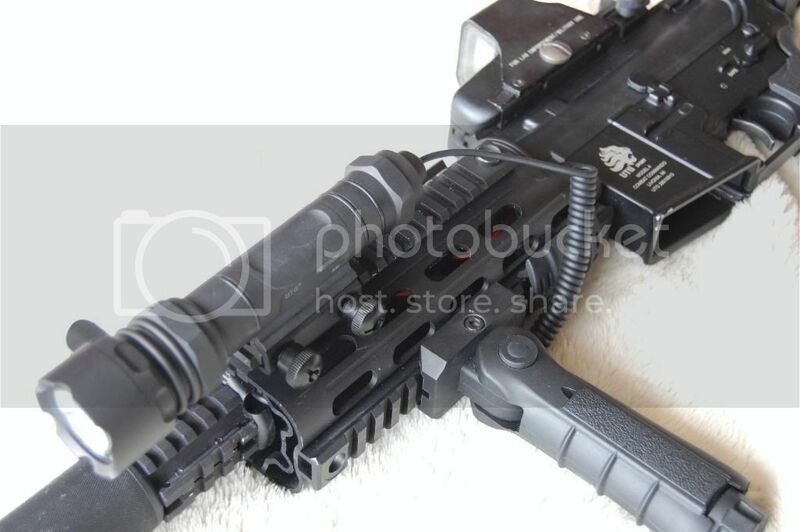 I obtained this light directly from UTG in order to review it here on Airsoft Retreat. I was very interested in their new line of taclights, and this model seemed like it would fit my needs perfectly, which it has. It is available at various airsoft retailers such as AirsoftGI, Precision Airsoft, etc, and is priced between $50 and $60. This light is made entirely of aircraft grade aluminum, which is hard anodized with a matte black finish. The ZL337 is the brightest light that UTG has released to date at 260 lumens, and is their top of the line Xenon model. They have a similar model with an LED bulb that is rated at 200 lumens; the ZL338. This model features dual center sections; one for handheld use and the other with an integrated mounting deck for weapon mounted use, as well as having a serrated strike face at the front. Among the other features are the included coiled pressure switch, twist-on constant and push button momentary activation with the base button, a law enforcement rated rolling stop shoulder, and the use of an integrated reflector bulb (IRB). The ZL337 came packaged in a retail ready cardboard package complete with a loop to hang it on a retail display hook. It has a window showing the light held inside, as well as a good amount of information about the light printed on the side and back. Everything is held secure in a high density foam lower, housed in a cardboard base box. The whole kit consists of the head, which houses the IRB and strike face, the handheld body tube, 20mm mounting deck body tube, base ring, base button, coiled pressure switch, 3 CR123 lithium batteries, a small piece of Velcro to mount the pressure switch, and a small manual. It provides you with several options as far as light use, as you can use it as a handheld light, weapon mount with twist/push activation, weapon mount with pressure switch, or even handheld with pressure switch if you feel like it. This light is made entirely of metal, specifically machined aircraft grade aluminum, which is finished with a hard anodized matte black finish. Youâ€™re not going to break this thing under normal use. It has several O-ring sealed points in order to keep moisture out, but it is not designed to be submerged, so donâ€™t do it. Starting at the base, there is a hexagonal base ring, which unscrews to allow for battery installation, as well as allowing you to install your activation switch of choice. If you unscrew it, you can insert either the twist/push activation button or the coiled remote pressure switch. It screws onto either the handheld body or the mounting deck, whichever you choose to use, and is sealed by two internal O-rings, and an additional external one on the mounting deck body. The activation methods are quite simple both in design and in function. The push button serves two functions, allowing momentary push button use, and constant on use by twisting the base ring. The momentary switch seems high quality, and allows you to mount the switch elsewhere on the gun for ease of use. The handheld body serves its purpose nicely, and offers you a relatively comfortable way to hold the light. It is not textured, but it will not slide easily out of your hand due to the base cap and the rolling stop shoulder. The mounting deck body has the 20mm rail mount interface molded into the main tube, so thereâ€™s no clumsy ring mounts necessary to secure the light to a weapon. It is equipped with dual thumb screws for QD use, and only has one cross bar on the mounting surface, so it should mount to more or less any 20mm rail surface. Iâ€™ve mounted it on a dozen or so different weapons systems with no issues. Iâ€™ve even mounted it on horribly out of spec rail surfaces by putting a small piece of Velcro on the mounting deck to push it up a bit, allowing a secure mount even on some FUBAR rails. The body is sealed by several O-rings where it meets the base cap as well as the front end. The front end has the rolling stop shoulder, bulb and lens assembly, and the self defense strike face. The bulb itself is a 37mm integrated reflector filament bulb, is has the focus preset for optimum use. The bulb used is a standard high output filament type that is charged with Xenon gas to prevent Tungsten deposits from lining the inner walls of the bulb itself. Replacement bulbs can be obtained through UTG/Leapers. The strike face is serrated and is somewhat sharp, but thatâ€™s kind of the point. Just use common sense here and donâ€™t hurt yourself or others. The strike face can be unscrewed to change the bulb assembly or to inspect the lens for damage. Overall, this is a rock solid flashlight externally. I donâ€™t see any obvious failure points to look out for, but make sure the surfaces where the base, body, and front end connect are kept clean, as thatâ€™s where the electricity from the batteries travels through. Putting it bluntly, this is an extremely bright light. I have no way to test the 260 lumen claims, but Iâ€™m inclined to believe it just by looking at this thing. It projects a bright focused beam out to great distances. The projector is pre-focused for a relatively small beam pattern at distance, without too much light over-splash, so to speak. The bulb also puts out a lot of heat, so much so that you feel the warmth by shining it on your skin from 12â€ away after only a few seconds. Common sense should dictate this, but donâ€™t touch the lens during or immediately after use. With this much power output, battery life isnâ€™t terribly long, with UTG claiming only 70 minutes. This is overkill as a navigational flashlight, so its use will most likely be limited to brief encounters. Iâ€™m very impressed with this latest light offering from UTG. Leapers has been in the optic/light/accessory market for quite some time, and their products are by and large designed for real steel usage, and this is no exception. I would feel comfortable mounting this light on any of my airsoft replicas as well as several of my real steel firearms. 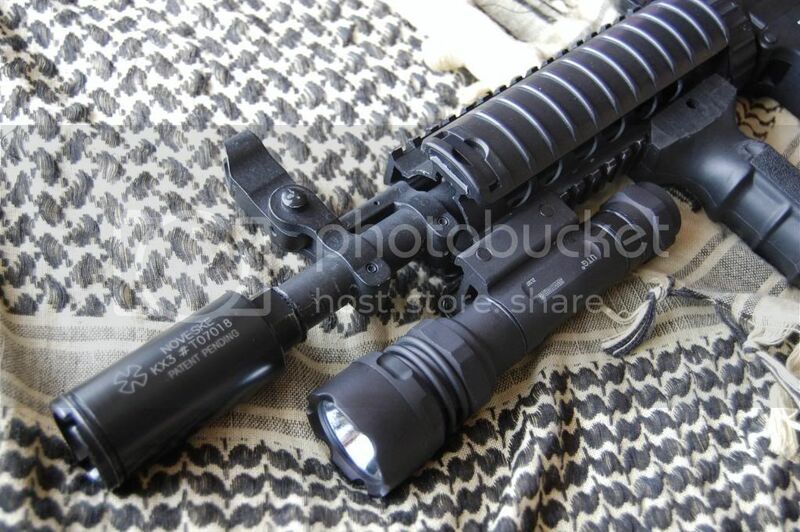 The power output, solid build, and multiple function use all add up to a great tactical light! Many thanks again to UTG, Deadrag Airsoft Radio and of course, AirsoftRetreat!